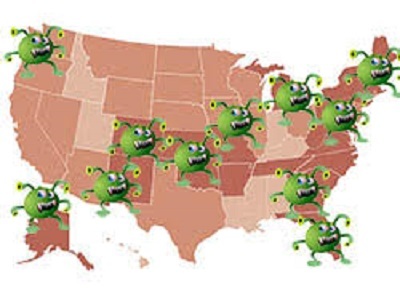 A new report from EnigmaSoft -- makers of the SpyHunter anti-malware product -- reveals the US cities with the highest rates of malware infection. Systems in Atlanta, Orlando, and Denver are most likely to be infected, with Louisville, Witchita, and Anchorage has the lowest infection rates. "It's hard to say exactly why one city or state has a higher rate of infection than others," says EnigmaSoft spokesperson Ryan Gerding. "There's a wide variety at the top of the list. Larger cities, smaller cities, and cities in every geographic area. The same is true for the least infected areas. New York and San Francisco ranked near the very bottom of the list." Infections are listed by state too, with Colorado ranked highest and Alabama lowest. The findings also look at the days of the week when malware is most likely to hit. Wednesday comes out as the most dangerous day, with Saturdays and Sundays the least, perhaps showing that even cybercriminals like to take the weekends off. Infections detected range from what EnigmaSoft identifies as Potentially Unwanted Programs or 'nuisanceware', which slow down computers and change some settings, all the way to ransomware, which threatens to delete valuable files unless the victim pays a ransom. "No matter what city or state you are in or what day of the week it is, it is important to always be vigilant about the threat of malware and other infections," Gerding adds. Find out how your US city ranks by visiting OUR FORUM.